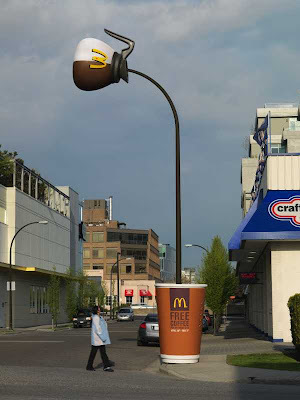 directdaily: McDonald’s "Free coffee ambient"
As part of a national campaign promoting McDonald's restaurants, a downtown Vancouver lamppost became part of an out-of-home optical illusion, appearing to pour coffee into a giant cup on the sidewalk. At the time, McDonald's was giving away free small cups of its brew for a two-week period, in an effort to attract new breakfast customers. They developed the concept for a lamppost near 6th Avenue and Cambie Street. The post was wrapped in brown vinyl to resemble poured coffee, while an oversized carafe was attached to the end.